Sweet Caroline ( good times never seemed so good ) ????????? album: "Brother Love's Traveling Salvation Show." Diamond himself reached number 4 in the US Hot 100 with this number. Elvis also recorded Neil Diamond's "And The Grass Won't Pay No Mind," which appeared on the original pressing of Diamond's 1969 LP release, "Brother Love's Traveling Salvation Show." 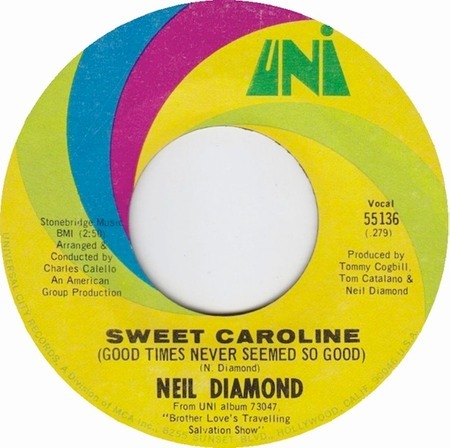 "Sweet Caroline" was not first issued as a single, on UNI 55136 (with its full title of "Sweet Caroline (Good Times Never Seemed So Good)"), read the text on the single ( from uni album 73047 (but, because of its success, was added to later pressings of the "Brother Love" album. It had long been assumed that the song was an ode to Caroline Kennedy, the daughter of the late John F. Kennedy, but in October 2014, during an appearance on the "Today" show, Diamond revealed that the song was, in fact, about his wife at the time, whose name was Marsha: he needed a three-syllable name, however.